It’s not every day I’m impressed by a smartwatch. Plenty of Android Wear and Pebble devices have come and gone and aside from a brief “Huh” I haven’t really let any of them capture my attention. Olio is different. The brainchild of former Apple and HP product designer Steven Jacobs, he wanted a watch that was rugged, usable, and easy to read. While he was aware of the competition, he used his hardware chops to put together something truly unique: a smartwatch design to combat immediate obsolescence. Here’s what’s up: Olio has made a smartwatch with the same care and concern as the manufacturer of a mechanical watch. Gone are the cheap materials and chintzy bands and the attention to detail – from the beautifully polished bracelet to the unique interface – speaks more to a universality that is missing in Android Wear and an attention to detail missing in Pebble . The UI is unique. Instead of an endless list of notifications a la Pebble, the Olio has a cloud-based system that only surfaces important messages as defined by the people you interact with the most. There are only a few screens available and the watch face itself displays the number of interactions per set interval of time using fanning lines of differing length. Longer lines mean you’ve received lots of notifications in that period and shorter lines means you’ve received less. Weather is front and center as are the timing tools, and to interact with any notification you answer “Yes,” “No,” or “Maybe.” Jacobs said he based this system on the memo system President Obama uses. The assistant will also, for example, see that you’re late for a meeting and offer to call you an Uber. The Olio watches are surprisingly well-built. From the unique charge coil in the “exhibition” back to the handsome screen, Jacobs has taken great care to create a watch that will survive more than a few years. It’s designed to offload most of its processing to the cloud and display minimal data on the screen. While you could upgrade yearly, that’s not really Jacobs’ goal. The heavy, nearly unbreakable crystal and solid steel case make the piece quite rugged and well worth the price. I first mentioned Olio in a very sneaky way. They weren’t ready to launch just yet so I bemoaned the fact that they were about to get run over by a Mack truck called the Apple Watch. While I’m sure they can figure out a way to avoid the potential fracas I’m still worried. The watch will ship this summer and is available for pre-order now and comes in steel and PVD-coated black. It starts at $595 and it works with iOS and Android. Jacobs is doing a bold thing: he’s trying to create a wearable that will last for more than a season. It’s quite an undertaking and considering everything about this is homegrown – from the interface to the OS to the case – he’s doing a great job. 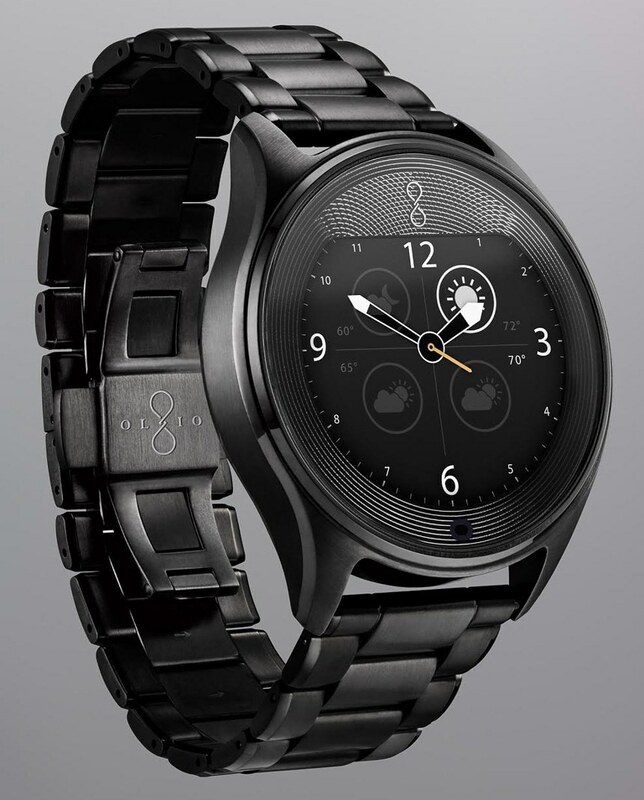 I’m looking forward to seeing this thing in action and I think it will be a great hit with the Anything But Google/Apple crowd hungry for a third player in the burgeoning wearables world.